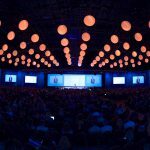 LONG BEACH, CA (Laserfiche)—January 25, 2012—Laserfiche today kicked off its “Empower 2012” Conference with a keynote speech from company Founder and CEO Nien-Ling Wacker on the importance of having an IT infrastructure that supports success in the Information Age. 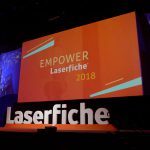 A record 1,600 attendees from the worldwide Laserfiche community are taking part in the event. The “Empower 2012” Conference, held at the Anaheim Marriott through January 27, features more than 150 educational sessions on everything from enterprise content mobility to cloud deployment strategies. IT leaders from Avis Fleet Services, Molina Healthcare and the Colorado Department of Natural Resources, among others, will share their Laserfiche expertise during Success Story presentations. Tomorrow’s keynote will feature Russell Kaurloto, Deputy CIO and Executive Director of Information Technology at the University of Southern California, and John Sifri, Information Technology Manager for the NFL’s Houston Texans. Epson is the Premier sponsor for Empower 2012, HP is the Platinum Lab sponsor and Infolinx is the nametag sponsor. Exhibitors include Accuflex, Avolve Software, Cambridge Connections, Canon, Cities Digital, Datawatch, Dynamic Document Services, Ezescan, FabSoft, Fujitsu, Kodak, Lincware, LLC, Millennial Vision, Novusolutions, Panasonic, Plustek Technology Inc, Scanning America and United Micro Data.